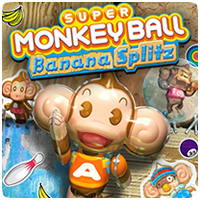 Super Monkey Ball Banana Splitz features over 1,000 stages across five worlds. The game also has 51 unlockable trophies including the Platinum trophy. Check out the trophy list for the game below. You earned all other trophies! Collected all bananas in all Monkey Ball stages! Clear all Monkey Ball stages in Beginner,Normal and Advanced using motion sensor controls! Cleared all Monkey Ball stages with no continues! Clear Cleared Monkey Ball Advanced Course World 5! Passed through all Monkey Ball warp goals! Cleared Monkey Ball Master Course! Clear Cleared Monkey Ball Normal Course World 3! You cleared 10 stages in 10 seconds or less in Monkey Ball! You got 100 extra monkeys in Monkey Ball! Clear Cleared Monkey Ball Advanced Course World 1! Clear Cleared Monkey Ball Advanced Course World 2! Clear Cleared Monkey Ball Advanced Course World 3! Clear Cleared Monkey Ball Advanced Course World 4! You stole 15 bananas in Monkey Rodeo! You cleared a Monkey Ball stage without collecting any bananas! You got 30 bananas in Monkey Rodeo! Clear Cleared Monkey Ball Beginner Course World 1! You got a bingo in Monkey Bingo! You got two bingos in a single game of Monkey Bingo! You crashed into a 100 bumpers! You cleared 10 Monkey Ball stages in the last 10 seconds! You created 100 edit stages! You’ve saved as many edited stages as possible! You landed a 500-point location in Monkey Target! You fell off 100 times in Monkey Ball! You played Monkey Ball with Baby 250 times! You played Monkey Ball with GonGon 250 times! Cleared 100 Monkey Ball stages! You dropped two balls in one shot in Battle Billiards! You shook a lot in Edit Mode! You sunk one monkey ball from each team in a match of Battle Billiards! You played Monkey Ball with AiAi 250 times! You played Monkey Ball with MeeMee 250 times! Monkey Reached the goal in a Monkey Ball stage with 0 seconds left! You got 50 correct in one round of Number Ball! You ran at top speed for 5 seconds in Monkey Ball! You uploaded a high score! Both characters reached the goal simultaneously in Love Maze! You retried 10 times in Monkey Ball! Clear Cleared Monkey Ball Normal Course World 1! Clear Cleared Monkey Ball Normal Course World 2! You got to ten in a row in Number Ball without any mistakes! You retook pictures in Edit Mode 5 times! You got 10 pixies to appear in one shot in Pixie Hunt! You got a chain of 10 or more in Pixie Hunt! You got a turkey in an abnormal lane in Monkey Bowling! You got a turkey in a regular lane in Monkey Bowling! You got 1000 points in a single round of Monkey Target! You got a synchronization rating of 200% in Love Maze! You saved 10 instances of Monkey Ball replay data!